There is certainly no lack of images that come to mind when thinking of France: the Eiffel tower and the hussle and bussle of Paris, The belle damoiselle, a baguette in the handlebar basket, as she pedals home on a cobblestone street, the sun and sea of the Mediterranean coast, the jagged white peaks of the Alps. And then of course the cafés. Ah, yes, French cafés, the “living room of the French” as the popular analogy goes. One can’t help but see Jean-Paul Sartre in an animated discussion on existentialism with Simone de Beauvoir, as both of them sip their espressos, and, especially, smoke their cigarettes. Though romanticized images, they are nonetheless true facets of French life; the Eiffel tower does really exist, Paris does move at a thousand kilometers per hour, you really do see people on bikes going home with their groceries, including the omnipresent baguette, in the basket, and French cafés are indeed the place par excellence to sit down and relax with friends, or maybe read the newspaper, while enjoying an espresso, and, very very often, a cigarette. Or at least that was the case up to the beginning of this year. The first of January 2008 brought a major change to the historical fabric of France. The “Décret n° 2006-1386 du 15 novembre (in French)” entered into effect. Seven articles that modify the French public-heath code and in doing so make it illegal to smoke in any public establishment in France, including all cafés, restaurants, bars and night clubs. This new law is extremely vigorous. Indeed, it’s not just forcing the creation of a non-smoking section in these “lieux de convivialité” (places of conviviality); that, in fact, already existed in French law, but was quite simply a joke in application. Oh sure, the cafés had a “no smoking section”, usually three tables squeezed in between the toilettes, the entry to the kitchen and the broom closet. 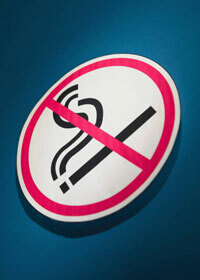 This new law however is a real knock-out punch to smoking in any enclosed environment that’s not your own home or car. Most notably the law imposes pretty fierce fines on both the smoker and the owner of the establishment who were not obeying the law. If café or restaurant owners should want to provide an indoor smoking zone for their clients, they are required to install what could best be called a smoking booth: a completely enclosed container, with an air extraction mechanism, in which no drink or food service is allowed. Imaging walking into a café and seeing what looks like a huge aquarium with 3 or 4 smokers squished together, looking long-faced at their espressos getting cold on the other side of the glass, and you get the idea. Not only would such a contraption be a virtual insult to the client, it is also much to onerous and expensive for most establishments. The end result being: if you want to smoke while drinking your coffee, it’s on the terrace, even in winter, even when its snowing. To do their best for their clients, most café and restaurant owners have invested in terrace heaters, to give a minimum of comfort to their smoking clientele. So how are the French taking this? Surprisingly well, knowing that around 34% of the French are smokers, according to a recent INSEE report (.pdf in French). Now don’t get me wrong, before the law went into effect, all you heard on the nightly French news were all the smokers outraged at how this law was the end to their individual liberties, how the law was going to ruin the only relaxing moment of their day, how it would put an end to the French savoir-vivre, etc. “Libérticide” was, in particular the catch-phrase of the day, the smokers conveniently forgetting that their liberties stop where those of non-smokers begin. One café here in Lyon decided to rebel against the new law, by openly refusing to comply with it, which of course got them national-level news coverage (and thus free advertising). The owner decided that he would allow his clients to smoke, take pictures of the resulting ashtrays, turn them into photoshop-art and sell the resulting ‘tableaux‘ to cover the fines. His café was, of course, the first to be fined (in French). But overall, the cases of non-respect for the new law can be counted on one hand, and that’s for all of France. Law, of course, follows the evolution of the society. Despite the air-time given to the raleurs (moaners), the majority of the French population wanted this law. It was even very popular among the smokers themselves, most of whom are quite conscious of the effects that their smoking has on others. Indeed, France is following the road already opened by Ireland, Italy and a few other European countries. Smoking is just no longer “in”, even in France. However the strictness of this new law has several paradoxical situations. Cigarette sales in France are regulated by the government and because of this there is another institution here called the “bar-tabac“. These establishments have a special type of licence given out by the government that allows them to sell drinks and cigarettes; something a normal café or bar can’t do. the whole idea behind these places is precisely to buy your cigarettes, and while your there, grab an espresso too. With this new law these establishments are suddenly amputated of the raison d’être: welcome to your local bar-tabac where we’re specialized in selling cigarettes and drinks together—and we have special permission from the Government to do so—but you can’t actually smoke your cigarette here. That’s already bad, but at least the bar-tabacs will still be able to do business. This is not the case for chicha bars. France has a large and vibrant Muslim community and chicha bars are very popular here. Of course the point of going to one of these establishments is to smoke, a bit like a cigar bar is in the States. Nevertheless, they too are considered to be “places of conviviality” and thus must respect the new law, which basically means that they are no longer in business, at least not in their original form. In both cases, requests for derogations are being made, but for the moment the French government is playing hardball and refusing any changes to the law. My hunch however is that this will change, at least for the chicha bars. The café is one of my favorite aspects of living in France. The living-room of the French analogy is right on: They are places where you can take a moment to truly sit back and let the day’s stress drift away. You can stay virtually as long as you want and the waiter won’t keep hammering you to buy another drink. The café is a true cultural institution and changing its core dynamic would be quite simply out of the question in France. I don’t smoke, so the new anti-tobacco law suites me just fine… at least most of the time. Yes, my last comment there implies that, well, yes, it’s a good thing, but, justement, has the French café lost a bit of its soul with this change? When I first moved to France in 1999 I absolutely loved going into cafés and bars here and part of the charm was the acrid smell of cigarettes, the slight haze of the smoke, it was all just so wonderfully Français for someone coming from the ridiculously sterilized United States. The “charm” stayed alive and well for about 2 years. After that, people smoking at the table next to mine as I tried to enjoy my tarte au citron meringuée, faite maison had changed back into inconsiderate jerks. Still, now that they’ve been sent outside with their cancer sticks, I must admit a tiny pang of nostalgia. Would Sartre have become Sartre if he debated philosophy while trying to control his umbrella and light-up at the same time in the cold winter wind whistling past the Café de Flore? Very good analysis of the French people.